This is a topic that is sure to be somewhat controversial, but I believe that using an angry and loud tone of voice to recall (get your dog to come) your dog can be practical in certain situations, and be non-toxic to the relationship you have with your dog. NEVER! Before I get started on how I use this technique, I want to make it crystal clear that I would never advocate raising your voice to a fearful or reactive dog. That IS as recipe for disaster and a relationship killer. I use this technique or my well-adjusted dogs that don’t have fear or reaction issues. I use a loud angry voice to call my dogs because it gets their attention and because I am being lazy, or frustrated. Is that honest enough for you? But my frustration, while genuine, is merely an attention getter and not harbinger of things to come for the dog. In fact my whole tone of voice changes as soon as the dog reacts to me and gives me their attention. 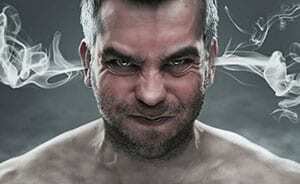 They key to using this voice is to not let the anger or frustration behind it take over. As soon as my dog responds and gives me their attention, my voice changes to a happy, praising tone; full of promise and reward. This is, in fact, the key. I’ve broken the hold of the object that previously had my dog’s attention; now it’s time to pay off. Using my best good dog voice filled with praise I again call me dog to me, normally prompting it toward me by moving away. Once the dog reaches me I offer more praise and the best treat that I can offer her at that moment. The refusal to come in the first place is forgotten and is replaced by the celebration that they did come in spite of my lax training sessions on recall. An interaction I had last night with my Aussie girl, Tosha, provides an excellent example of how I use this tool. Tosha was barking excessively at something I could not see in the yard and did not respond to the first commands for her to come. It was dark and icy out and I did not feel like dressing up to go outside to get her. I called “Tosha come” in a loud and angry voice. As soon as I saw her coming, I completely changed my tune. I praised her all the way inside and ran into the kitchen praising all the way to the refrigerator that held the chilled liver treats that were well worth her attention. I am not recommending this as an alternative to spending the time and energy to build a solid recall for your dog. And, as I’ve stated above, I would never do this with a fearful or reactive dog. But I do recognize, in myself and others, the ability to take a common frustration that many of us have and use it towards accomplishing both the short term goal of having your dog come when called, and the long term goal of having a solid recall on your dog.